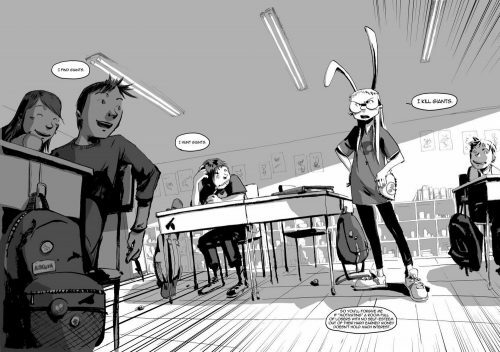 Not only do we have the great image from the graphic novel of I Kill Giants, we also have a great new clip of when Barbara and Sophia meet for the first time. Add to that a nice set of new images from the film and bingo, a great Monday! I Kill Giants tells the story of Barbara Thorson, a teenage girl who escapes the realities of a troubled school and family life by retreating into a magical realm fighting evil ‘giants’ – colossal monsters who attack her quiet coastal town. With the help of her new friend Sophia and her school counsellor, Barbara will learn to face her fears – tackling the mean bullies at school, coming to terms with her difficult home life and battling the mythic giants that threaten her world.